Hi, thanks to everyone for your warm wishes, comments, and emails. I flew up to Idaho, stayed a week, and did what I could to make sure my dad is okay. Like everything, it will be a process. I was blown away at the kindness of the people in Orofino, my birthplace. Everyone–bank tellers, people on the street, waitresses, bartenders, retirement home operators, and neighbors–went out of their way to help me and my dad. It was humbling and quite miraculous. So…about that tour. I know it’s last minute, but let’s reschedule the tour for October 19, this Saturday. 10am-1pm. We’ll extract honey, do tours on the hour, and I’ll be selling produce (tomatoes!) and books. My neighbor has some cute succulents to sell as well. See you Saturday. Thanks to everyone who came out to the farm last Saturday. It was a great day, though it was too hot. I swear, I’m going to buy an umbrella. I’m also going to perfect the samples so everyone gets to try everything without cutting off a finger (eg employing a useful tool called a cutting board). This weekend, I will get to put these new ideas up to good use because here comes another flurry of activities at GT Farm. This Friday, Oct 4, 5pm-7pm, we will be celebrating Oakland First Friday art walk by having a little open farm stand. Maybe we will be carving pumpkins. Maybe doing a honey extraction. Definitely I will be selling produce. I still have some tomatoes and pumpkins, and a couple plant starts too. 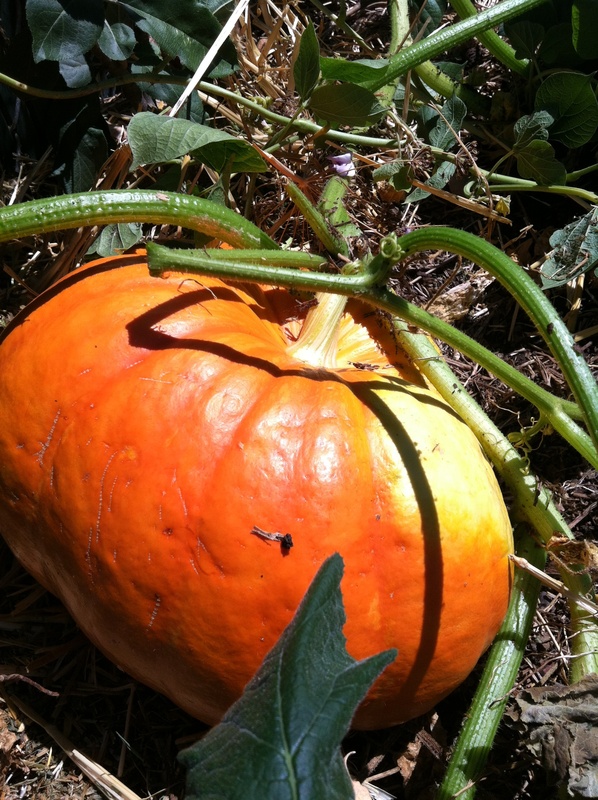 Here’s a pumpkin growing in the garden…. Then, Saturday Oct 5, 10am-1pm, it’ll be another, and the last of the year, open farm day. There will be tours at 10:15, 11:15, and 12:15. Come on by and meet the chickens, buy some honey, and snag a pumpkin. The address, as always: 2727 Martin Luther King Jr Way (that’s 28th street and MLK, entrance on 28th Street). Also: thanks to that guy who brought me that giant beautiful green pumpkin!! That was sweet.